The 2016 European Championship play-offs have finished, with Ukraine and Sweden completing the list of 24 teams to qualify for next summer's finals. Which four teams came through the two legs to book a place at the finals? Ukraine have only competed in one Euros finals before (2012). Ukraine had lost in four World Cup play-offs and one in the European Championship before their tie with Slovenia. They took a 2-0 lead from the first leg to Maribor, but conceded after 11 minutes of Tuesday's second leg when home skipper Bostjan Cesar headed in from close range. But Andriy Yarmolenko secured Ukraine's spot by converting after a late counter attack. Did you know? Ukraine had never previously qualified for a Euro finals. Their only appearance - in 2012 - came as co-hosts. Zlatan Ibrahimovic is expected to retire from international duty after the Euros next summer. Sweden saw off a late fightback from neighbours Denmark to qualify for the finals and keep Zlatan Ibrahimovic's international career going. The captain was inevitably at the heart of the second leg in Copenhagen, adding two goals to his first-leg strike, including a sensational curling free-kick. Did you know? Ibrahimovic has scored 62 goals for Sweden. Of those still playing, only Republic of Ireland's Robbie Keane (67) has more. 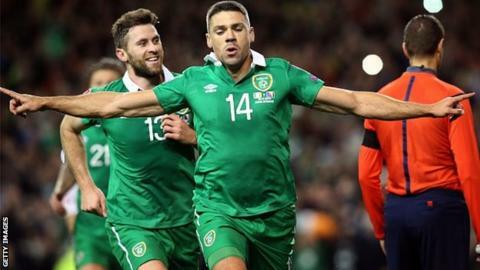 Six years after Thierry Henry's infamous handball denied them a place at the 2010 World Cup, the Republic of Ireland qualified as two goals from Jon Walters helped them overcome Bosnia-Herzegovina. Ireland drew 1-1 away in the first leg, Robbie Brady putting them ahead before Edin Dzeko equalised. Did you know? The Republic of Ireland have qualified for the European Championship finals for the third time (after 1988 and 2012). Hungary qualified for their first tournament in 30 years after beating Norway in both legs to win their play-off. They won the first game in Oslo 1-0, with debutant Laszlo Kleinheisler scoring the only goal. And Tamas Priskin and a Markus Henriksen own goal put them 2-0 up in Budapest before Henriksen scored in the right net late on to pull one back. Norway had another couple of chances but never looked like scoring the two extra goals they needed. Did you know? 89% of the goals conceded by Hungary in their qualifying group games came from open play; a competition-high (equal with Luxembourg).